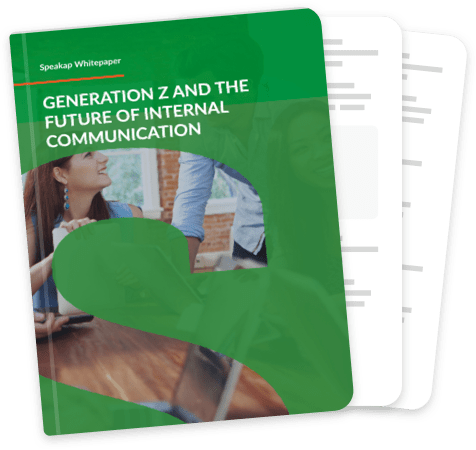 Talented members of generation Z, born between 1990-2000, are slowly but surely entering the workplace. They clearly have their own opinions, expect a lot from their employers and don’t need to be told about social media and smartphones. Welcome to the new era of internal communication! Generation Z is more demanding than ever. Even more than Generation Y (1980-1990), also known as the millennials. They are first in a series of generations who are used to superfast communication, 100% openness and continuous feedback. Unlike their predecessors, they have no affinity with politics or one-way communication channels. The way in which they connect with co-workers and review information is radically different. They expect employers to talk with them and listen to them. They expect a relationship based on collaboration and involvement. Yes Speakap, make me even more awesome with your white paper goodness!